I created a Bible Verse printable pack for this row. First, Jordan traced his Bible verse. Then we cut it apart and he glued it together like a puzzle in his lapbook. He used the Bible verse puzzle to practice it every day until he recited it by heart. We read The Berenstain Bears Love Their Neighbors and talked about loving others in word AND in action. My friend Kate sent me a Fruits of the Spirit Pack she found on Pinterest. 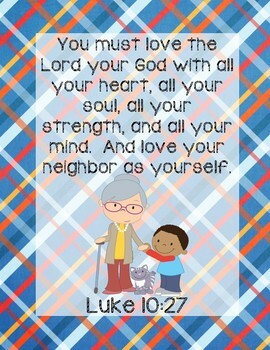 This was a great addition to our conversations about loving others in action. We watched Jesus Dies For Us (Jelly Telly), The Sun Stops Shining (Jesus Storybook Bible), and listened to the Fruits of the Spirit song (Go Fish) on our Mrs. Katz and Tush playlist. We did the “overflowing with God’s love” object lesson in the pack. This was a great tool to “talk through the lesson” while they enjoyed watching the pink bubbles erupting in their bowl. Haley pointed out that we can’t give out love if we empty. We need God to fill us up as we read our Bible and pray, so we can overflow His love to others! We dove into the history of God’s precious people as we studied their exodus from Egypt. We read The Story of Passover on our Epic app. Since this was our Bible lesson for the day, we read The Ten Plagues and watched Moses and the Exodus (Saddleback Kids) on our playlist. Afterwards, the kids colored a worksheet about the 10 Plagues. That evening we ordered Middle Eastern food and watched The Prince of Egypt. The kids LOVED it! One morning I felt inspired to create a special Passover-inspired breakfast. The kids were surprised AND excited. They ate their breakfast while I read aloud. We talked about persecution and how the Jews have been persecuted all throughout history. We watched a few clips from our playlist too. We read The Juice Box Bully which showed how kindness really can make a difference, even with a bully. This book also tied in our Bible lesson on “love in action”. We also read The Wren and the Sparrow on our Epic app. This was a heavy, but beautiful book about how the Jewish people were persecuted during World War II. We read a few books about immigration on our Epic app. I created an immigration box and set out an immigration activity using toothpick flags and our Montessori world map. Mrs. Katz immigrated from Poland to the United States of America, but she was also Jewish. So we had a flag for Israel, Poland, and the U.S.. Jordan used a little lump of play-doh and stuck each flag in the correct country. You could see the journey Mrs. Katz (and her relatives who originated from Israel) took before she arrived in America. Afterwards, Jordan looked through the various items from Israel (Little Passports), Poland (pictures), and New York (toob landmarks and pictures). We also read another wonderful immigration story about Irving Berlin on our Epic app. That weekend we took the kids to a children’s rendition of Fiddler on the Roof at a local playhouse. They loved it and it went perfectly with our row. We spent a little time studying Israel, Poland, and New York (USA). We read Israel (Countries We Come From) on our Epic app. We read Poland on our Epic app. Afterwards, we added some Warsaw inserts (Homeschool Share) in our notebooks. We read Exploring the States New York on our Epic app, Celebrating New York, and the New York page of Travelin’ the NorthEast. We even found the Catskills as was mentioned in the book! So exciting having literature come to life! I created a vocabulary worksheet for the Yiddesh words in this book. Each day we reviewed the terms he remembered until there were none left. He even recognized Mazel-Tov when we saw Fiddler on the Roof! Seriously, LOVE those moments! I purchased a set of cat preposition cards (Montessori Print Shop) to review with Parker. I set them out and had him match the labels. He struggled with a few cards, but we worked through them. This was a fun way to review our prepositions. Okay, let me just preface by saying that creative writing isn’t Bub’s favorite subject. Letting him type it up on the computer helped quite a bit, but it’s still not something he enjoys. This week his creative juices were FLOWING and I LOVED his story! His Sonlight Language Arts assignment was about migrating animals. With a little imagination and a dash of Polish inspiration, The Migrating Bison was born! He really put his all into this week’s assignment and I’m REALLY proud of him….go Bub! Another week I hijacked the creative writing assignment and challenged the kids to pick a cat breed, read about it, and write a paragraph. Parker chose to write about Persian Cats. He did a great job and typed his up on the computer all by himself. I created a Kittens for Keeps Sudoku Puzzle for the kids to work on while we read the book (a blast from our Kittens for Keeps row). The boys worked on their puzzles and we added them to their FIAR notebooks. 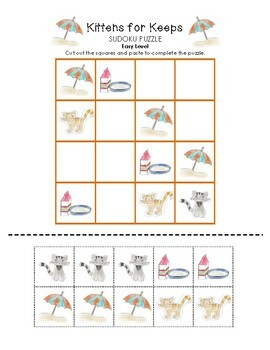 I also brought out our Melissa and Doug Kitten Pet Puzzle and our Which One Is Different worksheet. The boys completed a little Cat Math Multiplication booklet (Homeschool Share) and added it to their notebooks. We read Spotty, Stripy, Swirly which was a GREAT book about patterns in life. I set out a special mixed media cat folk art activity inspired by a folk painting I found on Pinterest. They selected their scrapbook patterns, traced/drew their cats, and cut them out. They used crayon pastels to create their background scene. We painted the cat cut-outs with white glue and added them to their scenes. Last, we used foam letters to spell out “kattileh” (Yiddesh for kitten). They were fun to make and looked adorable! We read Bread Lab! which was an excellent book to read when studying yeast, making bread, and the science behind baking. Jordan watched an episode of Come Outside – Bread on our Mrs. Katz and Tush playlist. Parker was learning about Louis Pasteur, so it was the PERFECT time for a yeast experiment. I set out the supplies and called Jordan into the kitchen. He added the sugar to the warm water in our bottle. Next, he measured out the yeast and added it to our bottle. He screwed on the lid and shook the bottle. He removed the lid and added the balloon on the top. He took a moment to draw a face and thus we dubbed him “yeast man”. We left “yeast man” to rise to the occasion. “Yeast Man” slowly grew throughout the day and was a fun addition to our kitchen! We couldn’t study this book without dedicating at least a day (or two) to some kitty cat learning fun. I made kitty bagels (orange-tinted cream cheese and Nutella), brought out our Kittens for Keeps Bingo, and cat themed books and worksheets. After breakfast we played several rounds of Bingo. This was something we did almost daily when Parker was in Preschool. It brought back wonderful memories! 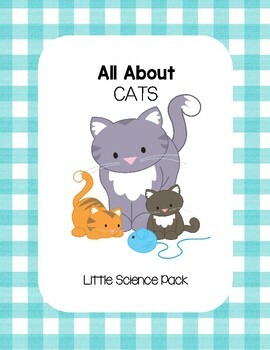 I created an All About Cats Little Science Pack for the boys to work on. We read all about Cat and loved the Pebble Plus series by Christina Mia Gardeski. The kids started working on their packs after our family bingo rounds. Jordan added his cat inserts into his FIAR notebook. We continued our second day of kitty cat learning with overnight oats and mini kitten pancakes. Otis and the Kittens was our morning read-aloud. It was another wonderful story in the Otis series. We read more about our favorite pet and I brought out our Parts of the Kitten Definition Cards that we used when we rowed Kittens for Keeps. I printed our Label the Parts of the Kitten worksheet for the boys to add to their lapbooks. The boys colored the parts of the kitten while I read the definitions aloud. We did a really cool glue, salt, & watercolor cross activity to follow up our Loving Others in action Bible lesson (The Littles and Me’s Fruit of the Spirit Pack). I printed a cross template, included in the pack, on cardstock for each kid. First, the kids traced their crosses with a thick line of white glue. Next, they sprinkled a heavy amount of salt on top. Then they used their watercolors to touch the tip of the salt line and watched as the colors spread. They continued adding color around the perimeter and watched the bleeding effect. We couldn’t row this book without making Kugel. I decided to make a savory version so we could use it as a complete meal….two birds, one stone and all! Jordan cracked the eggs, a skill he’s try to master with one hand. We added the other ingredients and boiled the egg noodles. We mixed everything together in one big pot. We set it in the oven and baked it to a nice golden brown. No pictures, but the kids liked it. It wasn’t anyone’s favorite, but it was healthy and satisfying. I found a passover version of The Little Red Hen at our local library. I grabbed it on a whim and was SO happy I did. It was really cute! The story was similar to the traditional version, but The Little Red Hen had compassion on her unhelpful friends and allowed them to enjoy passover with her. They later pitched in with washing dishes while Red Hen relaxed after the meal! Too cute! Jordan once again took the lead on this baking adventure. He gathered our ingredients and started measuring out the dry ingredients. Traditionally you have only 18 minutes to make and bake the dough once the wheat and water are mixed together. I set the timer and he mixed the water, flour, and salt together. Next, he kneaded, shaped, and poked the dough. Last, we cooked it over the stove top like tortillas. We don’t have pictures, but we used our Matzah with tuna for an open-faced sandwich. It was YUMmy! Great job Bub….you rock in the kitchen! As with our other rows, we created a Mrs. Katz and Tush playlist with read-alouds, music, science, and other clips. 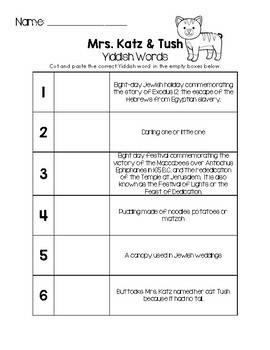 You can find most of the activities, ideas, and printables from this post on our Mrs. Katz and Tush Pinterest Board.